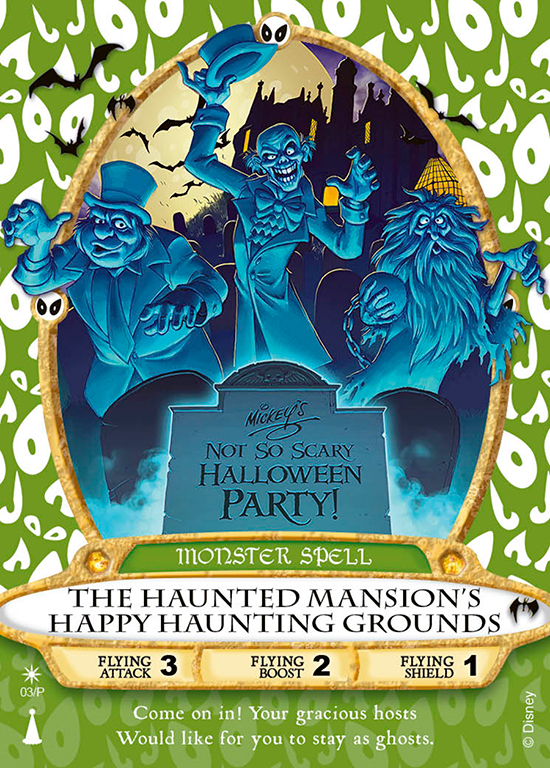 Grim Grinning Ghosts 9/5/2013 | Sorcerers Of The Magic Kingdom: The Blog! 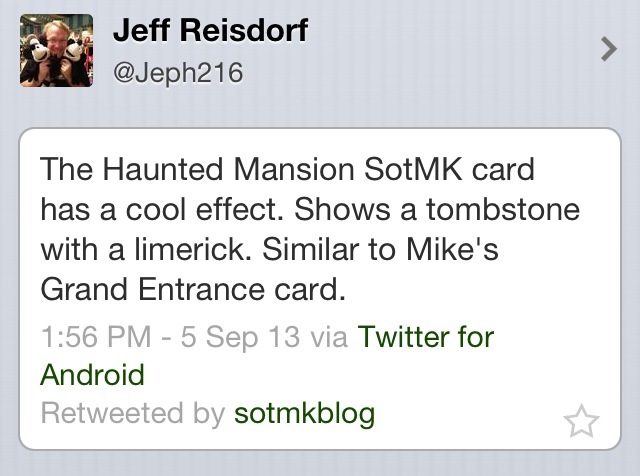 Level 1: A tombstone with a classic Haunted Mansion rhyme is seen. Level 2: Madame Leota’s Crystal Ball makes a mysterious prediction. Level 3: Madame Leota’s Crystal ball makes an ominous prediction and then shatters. Orlando Outpost posted a video showing at least 9 or so different animations. Seems like they did a lot of with this card. I’ve gotta manage to get this card! Looks amazing! Our tickets were for tonight and we got in line at the Liberty Square kiosk about 6:30 and there was a decent sized line that we didn’t think was moving because they were waiting for 7 to distribute the card. We foolishly decided to come back and grab it later. On our way out for the night we stopped by the Firehouse to pick up the card. We did this at 12 pm or so for both parties last year and they were nice enough to have a few CMs standing outside the Firehouse with a supply of event cards they were still distributing as everyone was finishing and leaving. This year the Firehouse was still open and running but when we got our event tickets marked they handed us the Chip and Dale card from last year! She said they had a huge crush of people at 4 when they started handing them out and only so many per day so they sold out of them. Had I known that was a possibility we would have stayed in that line at 6:30 and had our Mansion cards, especially sine we got the Chip and Dale one last year. I don’t know if the demand was higher because people like the Haunted Mansion more than Chip and Dale or if they have much less numbers to give out for each party this year. As much as I love Sorcerers they’ve not added or changed anything really since they’ve opened it early last year, so it’s not like there’s more demand for the game this year over last. We got hosed which had never happened before, so hopefully we can scrape the money together to go again and do it first thing. I could have easily done things differently and wish I didn’t have to. Andy, that’s horrible! I appreciate you giving the head’s up about the line. The plan is to get it right away anyway. It’s one of the only reasons we’re going this year. I think on one hand it’s cool they are giving out the C&D ones because those are more rare now…but still…arrangements for those who paid to get into the Halloween Party should have been made to get one. I really wish we could go during these special events. I love the special cards they give. Thanks for posting.